The BAT450-F family of wireless access points features multiple interface configurations. The customized design allows you to select the elements you need based on the unique requirements of your network and its environmental conditions. The device's robust connection options include WLAN, Wireless Wide Area Network (WWAN), like LTE and Ethernet interfaces. 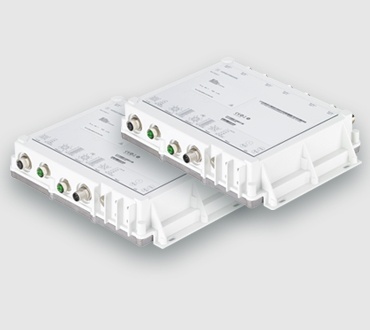 The BAT450-F access points also feature Hirschmann's HiLCOS software, which enables your network manager to confidently maintain secure and reliable wireless connections. The BAT450-F family, part of the BAT WLAN Solution Set, offers a compact and lightweight design. The access points can be used to quickly set up wireless networks, including distributions systems, through an automatic creation of point-to-point connections. Customizable configurations - Wide range of configurations available, including port type and quantity, as well as country-specific industry certifications. Ruggedized and compact design - Meets the IP65/67 protection class and operates at an extended temperature range of -40°C to +70°C to enable mounting on masts or walls in harsh indoor and outdoor areas. Secure operating system - Runs on Hirschmann's HiLCOS software to ensure maximum network availability and data security across wireless connections. Industrial Technology for Railway Systems and learn how wireless industrial Ethernet-based networks conform to global railway standards. Ruggedized and compact design - Meets the IP65/67 protection class and operates at an extended temperature range of -40oC to +70oC to enable mounting on masts or walls in harsh indoor and outdoor areas. Secure operating system - Runs on Hirschmannâ€,s HiLCOS software to ensure maximum network availability and data security across wireless connections.